Advion Insect Granule from DuPont. Advion Insect Granule gives you a wide range of treatment options and flexability as it is labeled to treat many places outdoors as well as indoors. It can be used as a broadcast treatment, perimeter treatment, or as a spot treatment on insect harborage areas outdoors. The active ingredient in Advion Insect Granule is Indoxacarb which is a highly attractive active ingredient to target pests, while at the same time having minimal impact on non-target species. * Cockroaches, apply 2.3 to 4.6 lbs. per 1,000 sq. 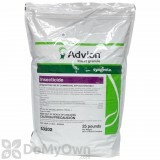 ft.
Advion Insect Granule is replacing the Advion Mole Cricket Bait. It is a dry granule formulation labeled for outdoor as well as indoor use. It can be applied by hand, a hand spreader, or by using a granule/duster such as the B&G 1150 bulb duster. A granular insecticide bait for use to control crickets, including mole crickets, on lawns in residential, commercial, public and institutional landscaped areas, golf courses, parks, recreational areas, and sports and/or athletic fields; cockroaches, and listed crawling nuisance or occasional invader insect pests in crawl spaces, attics, basements of buildings or structures. Advion Insect Granule may be applied as a broadcast application at the rate of 50 to 200 pounds of product per acre. Calibrate and adjust equipment prior to application to ensure that the proper rate of product is uniformly applied over the treatment area. Repeat application after 7 days, if necessary. To control pests, listed in table above, apply to ground area in a band up to 10 feet wide around and adjacent to the structure. To control pests, listed in table above, apply to soil areas, fence lines, ornamental gardens, pavement crevices, planter areas, vegetation areas and mulch areas. Advion Insect Granule may be used to control house crickets, field crickets, earwigs, silverfish and ants (except red imported fire ants, harvester ants, carpenter ants and pharaoh ants) in crawl spaces, basements and attics of residential, industrial and commercial buildings or structures. Advion Insect Granule will kill cockroaches that consume the bait granules when placed in crawl spaces and basements of residential, industrial and commercial buildings or structures, but this type of application alone is not intended to provide complete control of an indoor cockroach infestation. I applied the product as prescribed and within a few days I noticed that I did not have continued lawn destruction from mole crickets (that I never personally saw). This seems to be one potent product. If I get a recurrence of the laen damage, I will definitely apply another dose. We tried everything to rid ourselves of Mole Crickets! They were in the cracks around the foundation of our house, hopping all over the patio during the evening and keeping us awake! the DuPont granuals did the job as stated! Rid of crickets in 3-days. Super speedy shipping and great price. This product is the truth!!!! I wet the lawn and waited a few hours and then applied the product as specified--5 pounds per 1,000 square feet. Then I watered as directed. It looked like most of the area (about 2,000 square feet) was free of mole crickets. It's been about a week and they are back again. Lots of money for nothing! Thank you for your comments! We are sorry that you did not get the expected results from using the Advion Insect Granule Bait. When dealing with large mole cricket populations, you may need to bait more than once to eliminate them. Keep in mind that you want to delay watering after the granules have been put out. Per the product label: For best results, apply in late afternoon to areas of turfgrass that are infested with mole crickets. 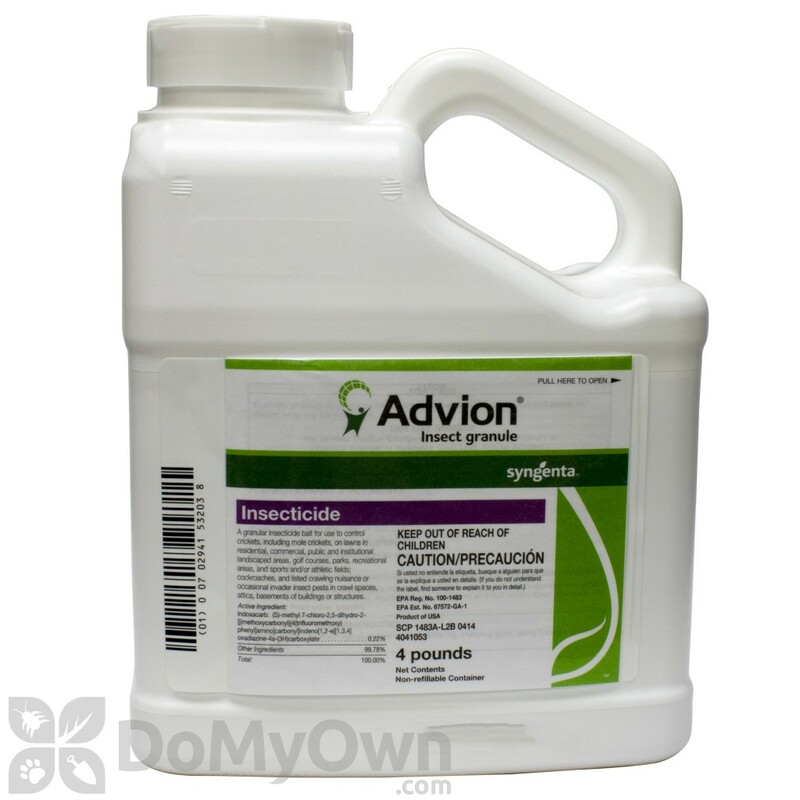 If the soil is not moist, then it is important to irrigate before application to bring the mole crickets to the soil surface where exposure to Advion Insect Granule will be maximized. For optimal effectiveness, allow grass that is wet with dew, rainfall or irrigation to dry before application. Rainfall or irrigation within 2 to 3 days after application may reduce the effectiveness of Advion Insect Granule. Please let us know if we can further assist you! I have had good luck with this product in knocking down some cockroaches. I also bought it to control ants not sure how well it is working on that yet but the cockroaches have been significantly reduced. Is Advion Insect Granule Bait harmful to pets outdoors? When used as directed on the product label, Advion Insect Granules should not pose any threat to pets. According to the MSDS if Advion Insect Granules are eaten: "No specific intervention is indicated as the compound is not likely to be hazardous." I saw squirrels eating the granules. What attracts them and will Advion Insect Granule Bait hurt them? I am using advion granular bait. Advion Insect Granules are a food based insect bait so the same thing that attracts ants could potentially attract other animals such as squirrels. According to the Advion Insect Granule MSDS "This product has no known adverse effect on human health if it is ingested" and therefore would most likely not have an adverse effect on the squirrels health either. If you do spread it along the whole lawn, how many sq ft does the 25lb bag treat? How often do you need to apply? Do you apply the granuels with your standard lawn spreader and apply to the whole lawn, or do you just sprinkle granuels where you see a cluster of ants? Almost all fertilizers, herbicides, insecticides, etc have treatments in amounts of so much product per 1000 square feet. So if you can figure out what your walking speed is then you know anytime you apply any product that calls for so much of it per 1000 square feet, you always set your spreader on this setting. You can calibrate this by marking off a 1000 square foot (10 x 100) area and placing the required amount of product in pounds in the spreader. Start with a low setting and start walking your marked off area at a normal pace. You can adjust as you go and find the basic setting for you to apply the product over a 1000 square feet. Can I use Advion Insect Granule Bait in my apartment? I am starting to see roaches (IDK what kind, I'm in Missouri) in my very clean apartment. The manager says they're likely from other tenants. I am buying the Advion Gel Bait but want this also. How can I apply this in my apartment to keep these bastards out until I move! Advion Insect Granules are not meant for use indoors for roaches. It is only labeled for crawl spaces, attics, etc. We would recommend using Roach Control Kit Rotation A instead. This comes with everything you will need to do a complete treatment for roaches. *To use the Maxforce FC Magnum tube, remove the closed tip by gently unscrewing it, and replace it with one of the included reuseable open tips. Use the provided plastic plunger or a bait gun to dispense the gel. *Use up to 1.5 grams of bait (15 x 0.1gm placements) per square yard for light to moderate infestations. *Use up to 3.0 grams of bait (30 x 0.1gm placements) per square yard for severe infestations. *After application, replace the open tip with the closed tip to keep bait fresh, and store in a cool, dry place out of reach of children or pets. *Roaches will die by ingesting the bait, physical contact with the bait or its residue, or from contact with roaches or feces of roaches that have consumed the bait. *You will need a hand pump sprayer such as a Chapin 1 gallon pump sprayer to mix and apply Temprid SC. *Use 2 x 8mL mono-doses per gallon of water for your first application, and 1 x 8mL packet for follow-up treatments, if needed. *To mix Temprid SC: Add when filling spray tank with water, or fill tank 1/3 - 1/2 with water, add Temprid SC, then finish filling the tank. Shake or agitate the mixture before spraying. *Reapply every 7-10 days as needed. *For situations requiring treatments over several months, rotate your baits using our Roach Control Kit B and Roach Control Kit C.
Can I use Advion Insect Granule Bait for ants in attics with insulation? Yes, Advion Insect Granule Bait is labeled for applications in attics of residential, industrial, and commercial buildings or structures. Please take a few moments to review our treatment article on How to Get Rid of Ants.